Scenic views and plush accommodations form a unique combination to make of your wedding day an unforgettable experience. 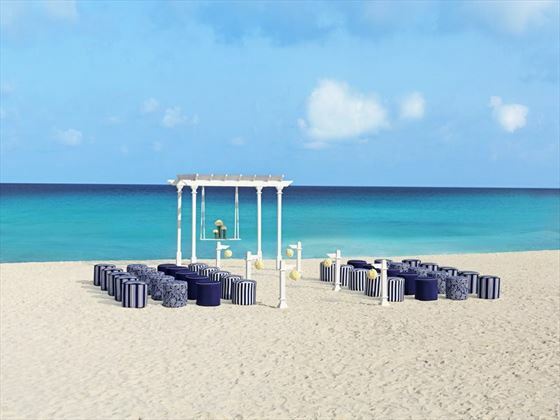 If you’re dreaming of the perfect ceremony overlooking the picturesque vistas of the Caribbean Sea, this is the ideal setting. 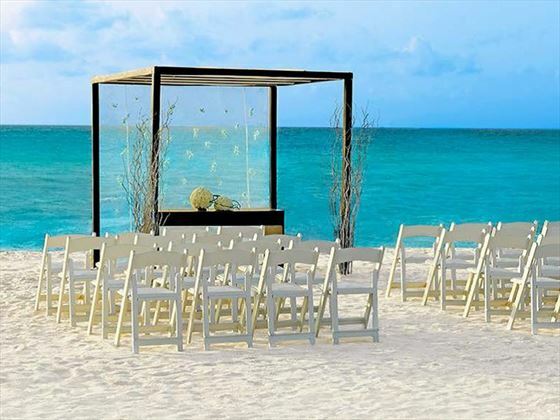 Wed on a beautiful white sand beach or under a romantic gazebo for a stunning celebration at Moon Palace Cancun. Free Classic wedding when staying 14 room nights. Or, if Bride & Groom are staying 7 nights and have friends also staying 7 nights, the Classic Wedding is free. 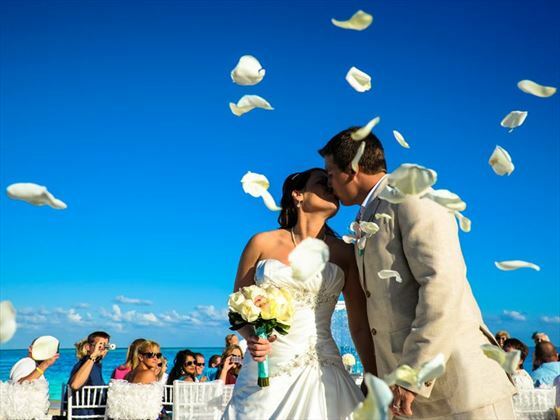 Please note that the Moon Palace Cancun only offers a small amount of outside wedding guests to come for the day. Once you have booked your dream wedding, the wedding coordinator will contact couples directly to arrange payment with you for the Government fees, this way, you don;t have to worry about this when you get there. When thinking about what type of wedding you want, you may also want to think about any family & friends also travelling with you. The Classic Wedding has been designed for Bride & Groom & up to 30 people, meaning a dinner reservation for up to 30 people including Bride & Groom in a semi private area is included! With compulsory blood tests, Judge fees to perform the wedding, and marriage validation mounting up to $1000 paid locally, we understand that getting married in Mexico might not be the most straightforward. That’s why many loved-up couples are now getting legally married in the UK, before travelling over to Mexico’s fun atmosphere and pristine sands for a symbolic wedding ceremony in a gorgeous resort. This option is perfect for those hoping to cut down the costs and keep everything easy-going. The wedding package inclusions below are based on a symbolic wedding, as all legal fees are paid directly to the hotel once confirmed. Perhaps you have your heart set on getting legally married in Mexico. If that’s the case, you’ll be required to have a number of document translations completed in the country at an extra cost, as well as blood tests and a Judge fee in order for them to conduct the legal wedding. Paid for locally, these all add up to at least $1000. The legal documents required for a wedding in Mexico are dependent on your personal circumstances and vary between the regions of Mexico and will vary from hotel to hotel as each region is looked after by a different Wedding Judge/Minister. It may be necessary to have some or all of your documents legalised in the UK prior to travel. This is the process of certifying the signature or stamp on a document to prove that it is authentic in order to be accepted by the overseas authorities. This is done at the Foreign and Commonwealth Office or the Ireland Consular by attaching a legalisation certificate to the document which is known as an 'apostille'. We have been advised recently that if you are single and never previously married or changed your name for any reason you may have the option to just travel with just your passport, saving you unnecessary time and cost. Whilst this will avoid the need for the translations of birth certificates and other documents, you must be aware that parents’ names will not appear on the marriage certificate. In all situations, we will work with the hotel Wedding Planners on a case by case basis. It may also be necessary to have Spanish translations made of some or all of your documents which for most hotels can only be done in Mexico on arrival at an extra cost, other hotels offer the choice of the translations being made in the UK prior to travel or in Mexico on arrival and a few insist that translations be made in the UK only. We have listed below documents that may be required, depending on your personal circumstances. Tourist ID. These are provided on the plane prior to arrival into Cancun International Airport. *If you have been divorced: Decree Absolute is required. If you have changed your name: Deed Poll certificate is required. If you have been divorced and have reverted to using your maiden name then this counts as a change of name, and proof of that change will be required. If you have been adopted: Adoption papers are required. If any of the above documents are required they must be legalised (except for your passport) by the British Foreign and Commonwealth Office at the address below, prior to travel. The approximate cost of this is £30 per document (subject to change). *If the Bride is divorced, at least a year must have passed before she can remarry) If divorced less than one year, a mandatory pregnancy test must be taken, (additional costs). If test is positive, wedding cannot be performed. Witnesses: Legal Wedding Ceremonies four witnesses are required. If the wedding couple provides their own witnesses the following is needed; passport copies & Tourist ID. If not the hotel will provide at no extra cost. Witnesses must be at least 18 years of age at the time of the ceremony. Both the bride and the groom are required to have compulsory blood tests taken before the marriage to determine blood type H.I.V and S.T.D. Tests must be taken at the resort. (If test is positive wedding cannot be performed). This will be done at a Mexican hospital (or in some cases, at the hotel) during your stay and will be at an extra cost. The marriage certificate will be issued in Spanish. Most hotels offer a translation service in resort at an extra cost, payable locally. Alternatively the marriage certificate can be translated in the UK. 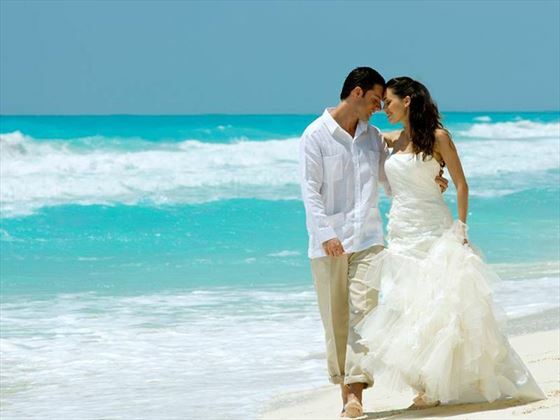 Please note: to ensure administrative problems or delays are not encountered, you accept that by booking a wedding in Mexico with Tropical Sky that you commit to taking the documents detailed by the hotel. Regardless if you booked a free wedding or not, in Mexico, the compulsory blood tests, marriage validation, Judge fees to perform the wedding are paid for locally and can amount up to $1000. As each wedding is individual we highly recommend that you scan all of your existing documents to us so that these can be checked for you. This may save you time and costs depending on your personal circumstances. However we feel that it is best to advise you of these additional costs if they are necessary. Where it is possible to be married by a Judge or Wedding Minister, the ceremony will be non-denominational unless otherwise stated and will be a civil wedding. When you book your wedding at the Moon Palace, the freebies add up quickly. Couples can earn free rooms, free upgrades and even free events like private dinners, cocktail hours and more. How does it work? Terms & conditions apply, please call for details. For outside guests, only 20% of the total number of guests staying at the resort will be able to come from outside, purchasing a day pass. 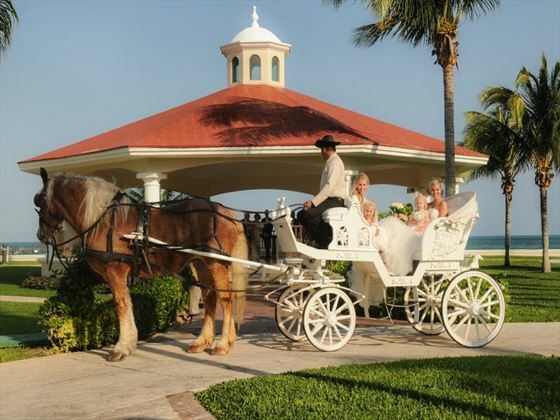 Outside guests will have access to the resort 1 hour prior to the ceremony and until the end of the reception. Day pass guests fee is US$210 per person.